RV Mendoza is becoming the adult that you’ve always needed growing up. A Queer Filipinx living and rocking in Detroit, RV is a disco pop artist and song writer and web developer who believes in making space for all that you are and allowing yourself to take up that space. Having worked through the challenges of growing up an immigrant in a predominately white school and focusing on one aspect in life that would define him, RV then focused in on his talents and interests, accepting all that he could be. Therapy has helped RV grow and his communities (LGBTQ, Filipinx) provide him a new home. RV beautifully represents a respect in oneself and a mindfulness on growth. 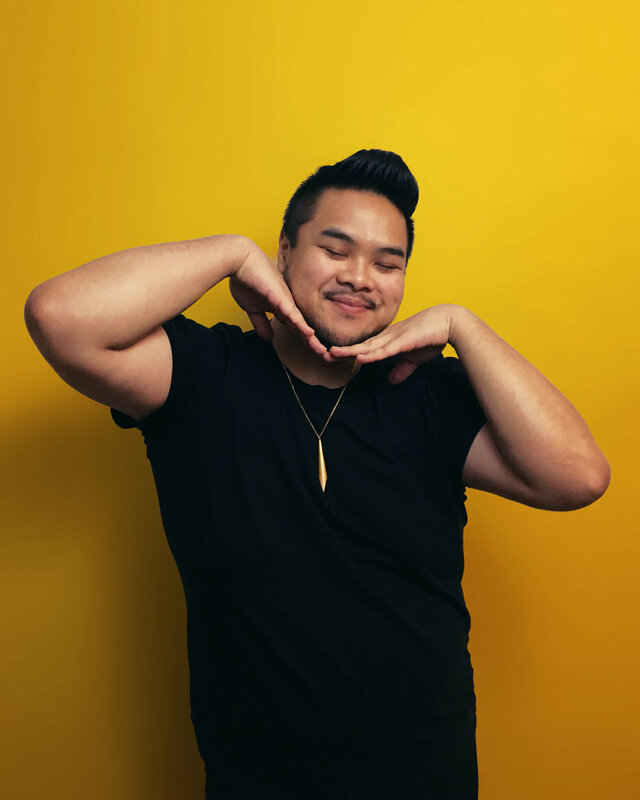 I am a Queer Filipino immigrant living in Detroit and I am a song writer, performer and web developer. You can find me on instagram at @RVxMendoza where I talk a lot about becoming the adult you’ve always needed when you were younger and at the same time serving hella looks. So come say “Hi”. How did you create your career path? And find a balance between web development and music? I was actually going to major in classical flute performance for most of my young life. That was my modus operandi, that was my goal. I realize now looking back at it, a lot of it was me trying to fit in and in order to fit in you had to have a “thing” and I wanted to be incredibly exceptional at flute and music. I wanted that to be my branding. And as is with that kind of situation, it started becoming a chore. When you’re trying to do things based on how other people perceive you, there’s something profound in there about being a queer immigrant, or at least in the closet at the time, and assimilation and how we deal with it. For me how I dealt with it was by learning the rules and playing the game better than any body else. What I did was I chose my branding and I presented it to people in a very packaged way. Near the end of high school I complete burned out on music, I tried to excel so intensely with it, and the thing is when you’re doing something for other people you’re not being a real person, you are a being a PR company, at least that’s what I was doing. I think some higher version of me was telling me that I was not going to be happy pursuing this as a major, pursuing this for the rest of my life because I think I secretly knew it was more about assimilating and that was the pressure that I felt being in a high school that was majority white. And mixing that with being queer, I used my talents as a distraction tactic, which is so intense. The lengths we’ll go to get people to redirect their attention towards something else. Just mixing that with being an immigrant and being queer, it was just a lot. So near the end of my high school career I had an identity crisis because I thought I was the “flute player”, that’s the role I was playing for everybody else. And so I had to figure something else out because I knew I wasn’t going to be happy. As I looked around, I realized I was always on the internet. I had an angel fire website that I pruned constantly and I was in love with the internet. I loved how infinite it felt. So I decided to find a major that could support that. And I ended up going to school for web development, and I got an internship in Detroit. And then I got hired into a company and I bounced around for a while and now I’m back with my original company doing web development and honestly I really love it. In terms for balancing web development and music, because music was kind of like an abusive relationship for me in high school, I had redevelop a different context. My love for music came back for me in though pop and through song writing pop music. So I started writing music in my room and then I started performing at different festivals that were happening around Detroit and Detroit seemed to really like it so I just kept going. I think there’s a pressure to be one thing, and to have one thing that you do, and I am trying to find that balance in myself, that I love multiple things. I’m passionate about multiple things. My life has been trying to find that balance between my web development career and something I really love, which is also music and not trying to put too much pressure on it and just trying to enjoy it. But also my intense need to optimize and be that PR company in high school because a lot of music is perception. So I think trying to balance it is accepting that I can be multiple things. Like I said before, this whole story of assimilation you get to be one thing, you get to either match somebody’s perception or be the exception and be completely different. And I think that’s part of my own decolonization work, is acknowledging that I contain multitudes. I am not one dimensional, I am not one thing, I am everything. So how I balance things is accepting that I can be multiple things and then making space for it because there is space, I just have to allow myself to take up that space. My all time favorite song is called “You Blew It” and it is about my first crush that I ever let myself have. And what I mean about “letting myself have a crush” is I was also very involved in Christian community and this Christian community was very adamant about not being gay. So I would take any crush that I potentially have and just compress it into nothing and throw it away. And that’s what I did for a lot of my life. I started hanging out with this guy and he was so nice to me and it was this weird “are you gay, too? I don’t know. We’re acting very much like we’re in a relationship right now this is very emotionally intense.” And then everybody knew around me what was happening. Regardless of what he though was happening, we were a couple because we were doing couple-y things. It eventually reached this peak where I told him what I felt about him and I was just completely rejected. He told me he was 100% straight and that he didn't see me in that way. So I decided to make boundaries and lick my wounds a little bit and I wrote this song out of frustration that I couldn't accept the situation. So I was like, “you blew it.” And my favorite lyrics are, “ooo my lips are like honey but you say you’re not a bee.” And I’m not going to go any further that that because you can listen to it on Spotify, that’s where the tea is. What/Who has been instrumental in your creative and personal growth? Therapy has been instrumental to my creative and personal growth. For me therapy is like getting a Phd in yourself. It helped me because it allowed me to examine a lot of the defaults in my life and the tapes that I play in my head when situations happen. I think when you’re younger you experience hard things before you have the tools to happily process them. So we develop solutions in that moment to survive that situation. And that continues on in life and we continue to have that same reaction to things as if we were that young person and I feel like therapy and growing up is a lot about understanding that at one point that strategy helped you survive when you were younger it helped you push though the situation. But now that we’re older, is it useful? Is it serving you? And deciding to either keep it or change. And I think that’s where true growth and maturity comes from. It’s been really fun lately because I found a group called Filipino Supper Club where we cook and we eat and we commiserate and we talk and do karaoke. It’s been super fun to unite a lot of the Filipinos here in Detroit. I think a lot of it is focused on decolonization, doing that in not this very serious deconstructive way, but just to make space for each other and to love each other in all of our iterations of Filipinoness. I’ve been really thankful for that group because it makes me feel at home. When I say “at home”, as a Filipino immigrant that came to the US, I sometimes feel like I’m too foreign for here and I’m too foreign for there and when I’m with Filipino Supper Club, it feels like a new home, a new place. Where does your confidence and love come from? I feel like my sacred calling is becoming the adult I’ve always needed when I was younger. I am becoming the representation I always craved, the love that I never let myself have access to, and the gentleness I never gave myself. And for me, my big calling in everything I do is to help people realize that they too can become the adult that they’ve always need when they were younger. Through my music, through my writing, through my web development even, I just want people to grow into the person they needed. Do you have any advice about embracing yourself and finding courage inside? I think my biggest advice is to respect yourself for where you are rather than where you think you ought to be. Because a majority of my life I have spent in a place where I was living for the future and I compared myself to where I think I ought to be and I was incredibly disappointed every time. I think if you were to really accept yourself for where you are in the moment, where you are and all of your flaws, then you can finally move forward. You can’t change something you don't accept. Because if you’re truing to change something that’s way out in the future you’re making a solution for a problem that doesn’t exist. Are there any events coming up that you're excited about? In about a week I will be traveling to Chicago to reform with Tunde Olanrian February 15 at the Sleeping Village and I’m super excited about that. I’m excited to connect with the Filipinos over there. It’s hella lit over there with the Filipino culture and youth culture, it’s so amazing. Everybody should go check it out. Yeah, I’m just so excited to go to Chicago.